The parliament voted 2,958 in favour and two against abolishing presidential term limits. Xi Jinping received near unanimous support in parliament. CHINA’S XI JINPING has secured a path to rule indefinitely as parliament abolished presidential term limits, handing him almost total authority to pursue a vision of transforming the nation into an economic and military superpower. The move reverses the era of “collective” leadership and orderly succession that was promoted by late paramount leader Deng Xiaoping to ensure stability following the turbulent one-man rule of Communist China’s founder Mao Zedong. The historic constitutional amendment cleared the rubber-stamp parliament with 2,958 in favour, two against, three abstentions and one invalid vote, despite an unusual bout of online criticism that censors have scrambled to extinguish. Xi stood up first at the imposing Great Hall of the People in Beijing to cast his paper ballot in a red box, as delegates of the National People’s Congress applauded after each vote on the constitutional amendment to lift the two five-year term limit for the presidency. The first constitutional amendment in 14 years had been expected to breeze through the legislature, which has never rejected a Communist Party diktat in its half-century of existence. “This is the urgent wish of the common people,” Ju Xiuqin, a delegate from northeastern Heilongjiang province, told AFP, echoing party claims that lifting term limits had the unanimous support of “the masses”. But the vote sparked some negative comments on Twitter-like Weibo, with one user defying censors to write “we’re over” while another said “we are back in the Qing Dynasty”, referring to China’s last imperial era. The package of amendments included major provisions to inscribe Xi’s eponymous political mantra in the constitution, give the Communist Party an even larger role in the country’s affairs and expand the president’s anti-corruption campaign. Xi, 64, has consolidated power since 2012 when he was appointed to the country’s top office, general secretary of the Communist Party. While the position has no term limits, his two predecessors both gave it up after two terms as part of an orderly process established by Deng. The country’s presidency is a largely ceremonial office, but the constitutional limits meant Xi would have had to give it up in 2023. But with the new amendments, he could now have a lifetime to push his goal of turning China into a global economic powerhouse with a “world-class” military by mid-century. His rise has been accompanied by tighter restrictions on civil society, with the detention of activists and lawyers, and stricter limits on the already heavily controlled internet. At the same time, he gained a measure of popularity among Chinese people through a relentless crackdown on corruption that has punished more than a million party officials, and sidelined potential rivals. “I think that during the past five years, he has been carrying out a soft coup, including making the Politburo a mere figurehead,” Chinese political commentator Wu Qiang told AFP, referring to the 25-member Communist Party body one level under the ruling council. “He wants to prevent power from falling into the hands of technocrats like Jiang (Zemin) and Hu (Jintao),” Wu said, referring to Xi’s two predecessors. The Communist Party has argued that the move merely aligns the presidency with the limit-free titles of party secretary and military chief. The party has claimed that “the masses” unanimously called for the removal of term limits. But the proposal was kept secret until it was revealed in a state media report on 25 February, a week before the legislature’s opening session. 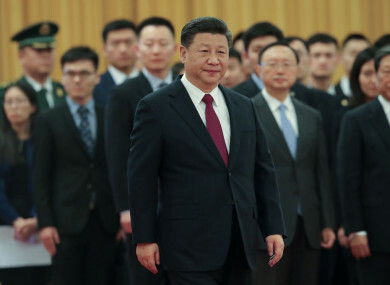 The party later disclosed that Xi had presided over a meeting of the Politburo in September during which the leadership decided to revise the constitution. The party then sought proposals and opinions, culminating in a decision in late January to introduce constitutional amendments at the NPC. “Xi Jinping has presided over so many important projects such as economic reforms and the fight against corruption. There was a consensus that we supported him having more time to finish his work,” said Dou Yanli, a delegate from eastern Shandong province. Activists fear that removing term limits may lead to a further tightening of already strict controls on media, civil society and religion, as Xi tries to impose his highly ideological vision of socialism on every aspect of society. Since the move was first announced, online censors have blocked phrases and words such as “I disagree” and “emperor” and the image of Winnie the Pooh, the cartoon bear to which Xi has been compared. Beijing-based activist Hu Jia, who says authorities forced him to leave the capital during the congress, called the amendment “illegal”. Email “China clears path for Xi Jinping to rule for life”. Feedback on “China clears path for Xi Jinping to rule for life”.